Welcome to the JFKS Biology Department! Biology, the science of life, connects our German and American colleagues. Instruction is held in either German or English. With our Chemistry colleagues we share seven science rooms and three collections, located around a large lab area. We are very fortunate to also have a lab assistant who supports us in our practical science work. At JFKS we have many broadly interested students and would like to do them justice with our contentual and methodical offers. We are trying to create a relaxed learning situation with a high level of expectation, combining a qualified education with practical relevance and fun. Biology instruction focuses on the discovering learning of every day phenomenons. Through experimental analysis, practical exercises like microscopy, acquired knowledge is connected with applications. Students hereby explore important issues of their lives. In two hours per week 7th grade students explore domestic creatures, their correlations and habitats. Questions regarding human biology, nutrition, puberty and prophylaxis of addiction take on an important role. A project especially related to practice is the “Science Project”: Three hours of instruction are available to learn German through practical work with projects and a lot of fun. An important goal here is to develop a positive attitude towards a foreign language as well as to promote biology as a subject. Students experience important successes by taking care of our school animals or by writing a children’s book and presenting it to elementary school students. In two hours per week 9th grade students learn about the physiology of humans and plants. In 10th grade (two hours per week) there is an emphasis on human development, geneology and evolution. Interdisciplinary offers include the “biology-chemistry-elective” courses in 9th and 10th grade which provide the opportunity to model the contents according to the students’ interests. These classes offer the possibility to prepare specifically for the Abitur (5.. Pk) and MSA (Middle School Exam). The practical work and learning and applying of various methods including portfolio work are in the focus. Small classes allow a relaxed working atmosphere and an individual work process. Students work on projects like “Profiling the perpetrator”, “From the sheep to the sweater”, “Bionics – learning from nature”, “Small particles, quite big – advantages and disadvantages of nano technology” etc. In grades 7-10 “science-lab” and “science” classes are offered in English, two hours in 7th grade, two and three hours in 8th grade, 6 hours in 9th and 10th grade. These classes do not follow the German curriculum. In grades 11 and 12 biology is taught on Grundkurs and Leistungskurs level for three respectively five hours, AP Biology is offered with six hours and AP Environmental Science with four hours. Early on our students can get a taste of university. Through the “Meet-a-Scientist” program which has been an established part of our program for years, scientists share their passion and fascination for their research with our students, hold lectures, lead discussions and show students career perspectives. We also like to invite parents to this valuable learning experience. An excursion is an important part of the Biology Leistungskurs. In the past there have been marine biological excursions to different Marine Biology Institutions or exploring the ecological system Wattenmeer and the Biospährenreservat Nord-Ost Rügen. An excursion about Spreewald biology and re-naturation of brown-coal mining areas is being prepared as well. 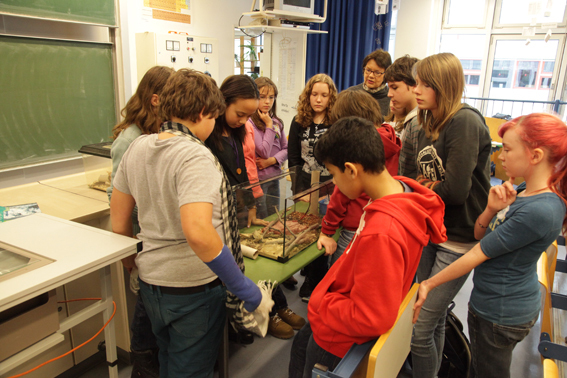 In all grade levels instruction is supplemented by field trips to venues including the Zoo, the Aquarium, Museum of Natural History, the Botanical Garden, the Ozeanum Stralsund, they learn about the function of a sewage treatment plant or a coal power station and know and use the offers of various student laboratories.